I have another Halloween card to show you today. 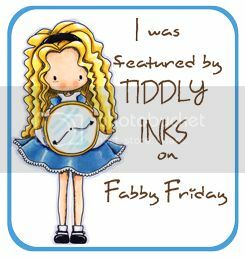 I've used a Tiddly Inks image on this one too. I love the Wryn character. She's so adorable and reminds me of one of my nieces <3. And of course this card is for her. My sweet little redheaded Norwegian-American girl <3. Papers are from the Graphic 45 "Happy haunting" collection. I've used a die from La La Land craft for the spider webs and covered the webs with black soot distress paint and glitter. The skull flower is from making memories and the roses from Prima. Ribbon from May Arts and Really reasonable ribbon. Corked vial and wish bone from Tim Holtz. I'm entering this card in the Simon says Halloween challenge. 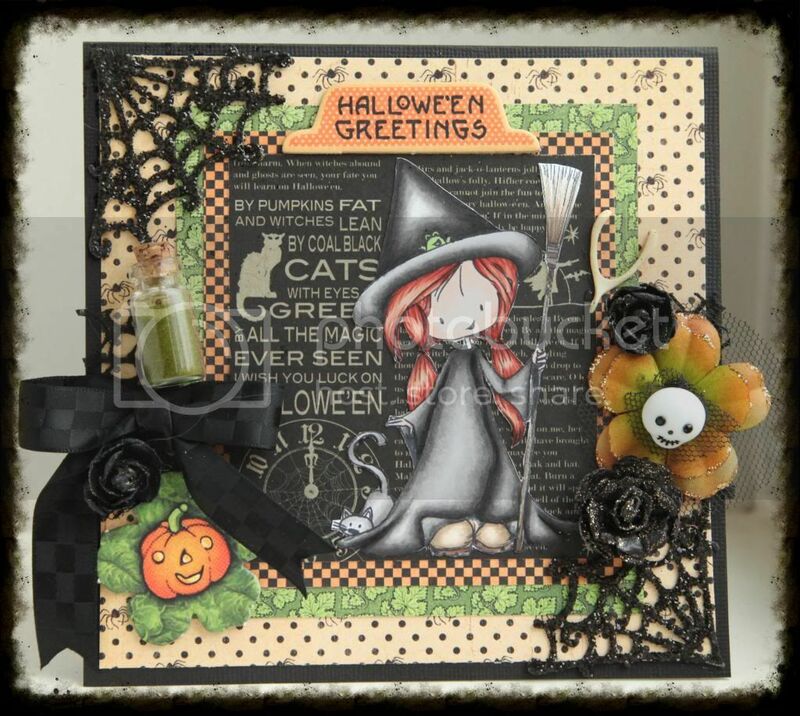 Sharing a Halloween card with you today! 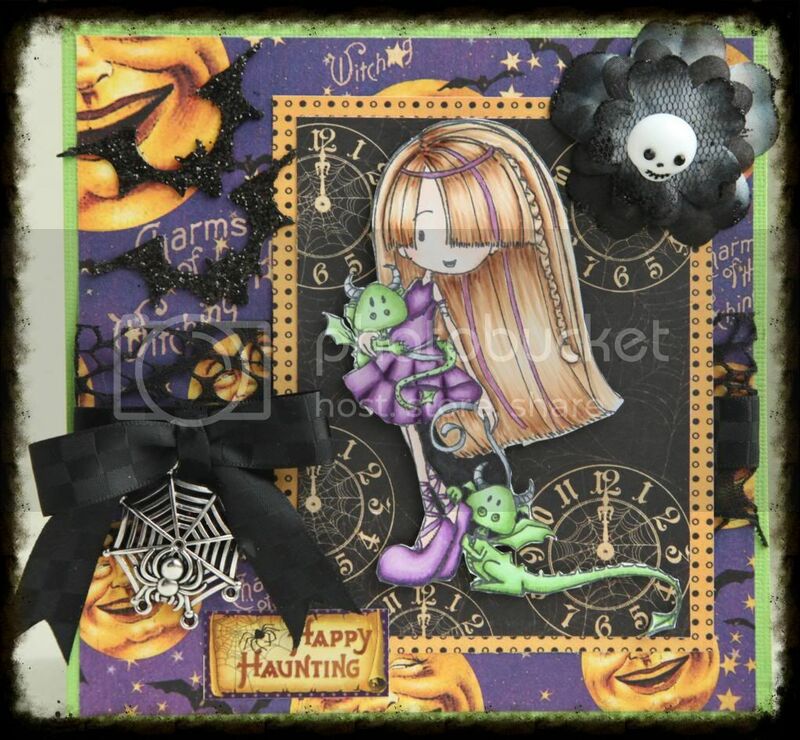 The supercute image is from Tiddly Inks and papers are from the Graphic 45 "Happy Haunting" collection. The bat die I have used is from Tim Holtz and I have decorated the bats with "Black Soot" distress paint and glitter. Ribbon is from May Arts and Really Reasonable ribbon. The Metal spider web is from Panduro and the skull flower from Making memories. Today I'm sharing a christmas card with one of my favorite Saturated Canary images - Snow Blower. It's just so cute! Design papers are from Authentique's "Peaceful" collection. Text stamp from Kort&Godt. Flower and resin from Prima. I've distressed the edges and inked them with distress ink Pumice Stone. I've punched the snow flakes with Martha Stewart punches and embossed them with Ranger - Weathered white. Today I'm sharing this year's first christmas card. I've used two stamps from Bildmålerna, and text stamp from Inkido. 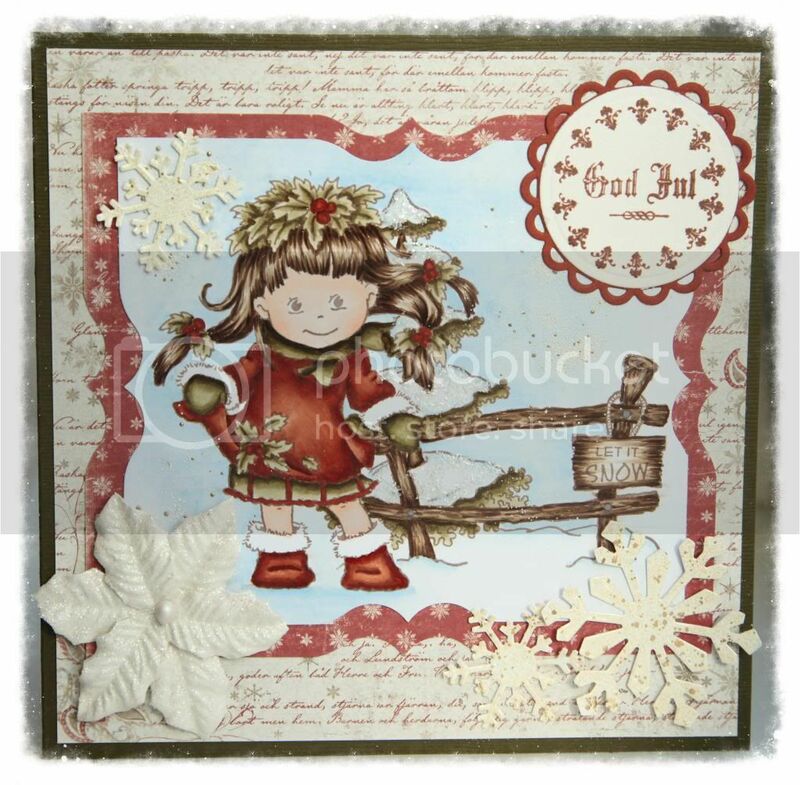 Papers are from the "Vintage Winter" collection from Maja design, and flower is from Prima. I've used punches from Martha Stewart and dies from Spellbinders. I've added some Frantage embossing enamel to the snowflakes and Picket Fence stickles to the tree. The images are colored with Copic Markers. 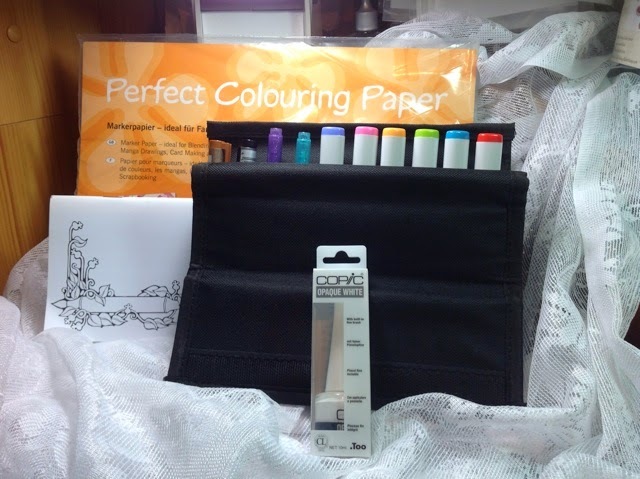 I'm taking part in Copic Marker Norge challenge #44 (use at least two stamps) with this card. Saturated Canary have paper piecing as a challenge this week. I've never tried this technique before, but it was quite fun. 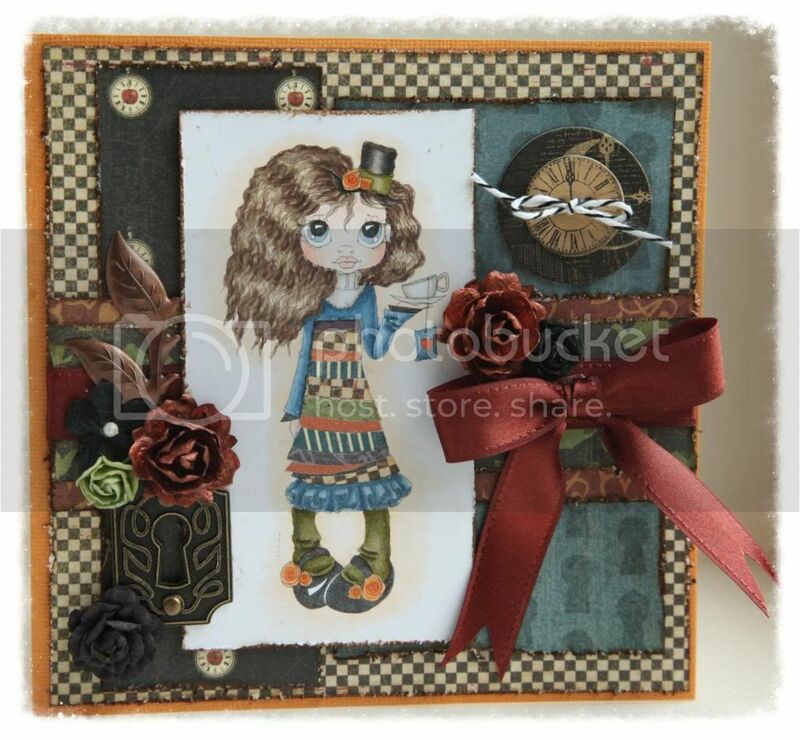 Used the "Hatress" image and paper pieced most of her dress using design papers from Graphic 45's Hallowe'en in Wonderland collection. Flowers are from Wild Orchid Crafts, Prima and Petaloo. The metallic flowers are dyed using a mixture of Arabic gum, pigments from Luminarte and Distress Ink refills. Key hole and chipboard from G45, metallic leaves from Prima mechanicals and ribbon from RRR. Distressed edges of the papers and inked with Distress Ink - Gathered Twigs. Colored with Copic markers. Used this week's sketch from Sketchy colors. I went a bit outside my comfort zone this time as I think it's really hard to color darker skin. I guess I'll just have to keep practicing. 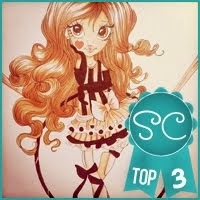 ;) I used the digital image "Princess Harvest" from Saturated Canary. 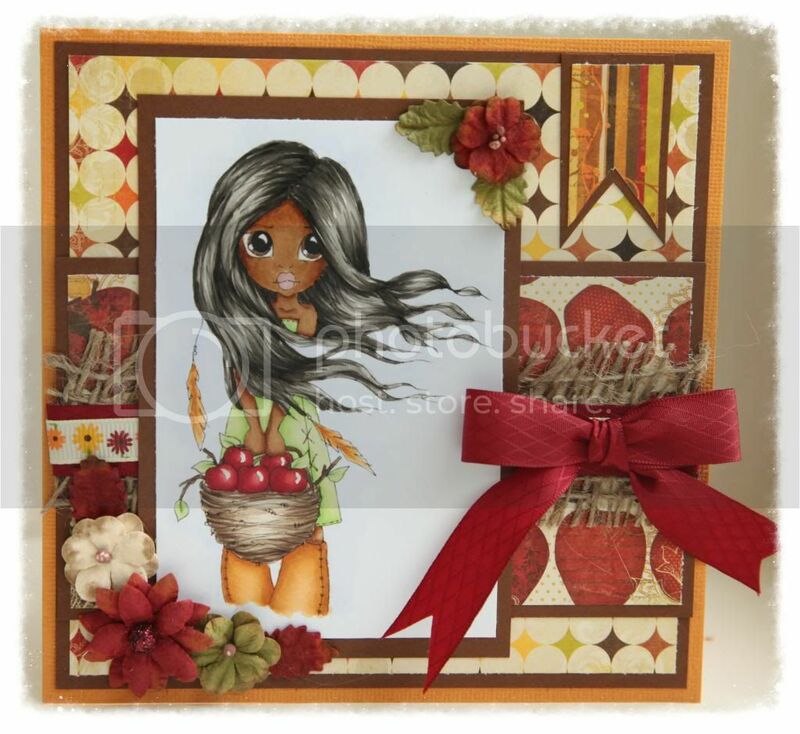 The design papers are from the BoBunny collection "Apple Cider" and the flowers are from Petaloo. Ribbon and burlap are from RRR. I love summer, but I have to admit that fall is my favorite season. <3 And the color palette fits me perfectly. I always end up buying loads of fall papers and fall stamps. 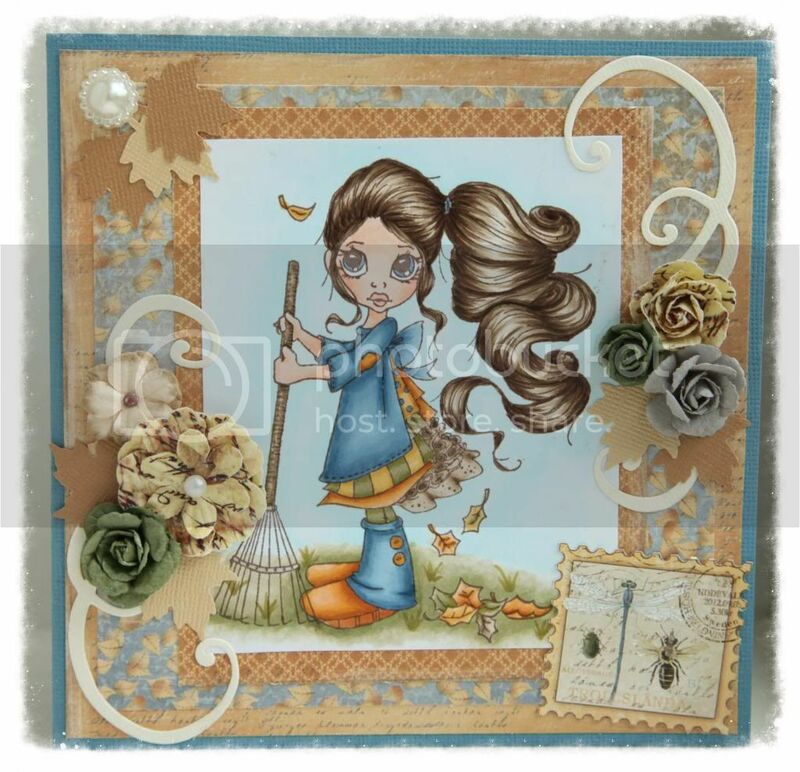 Today I'm sharing a card where I've used the rubber stamp called Autumn from Saturated Canary. Design papers are from the Walking in the Forest collection from Maja Design. I've also used a swirl die from Magnolia and a punch from Martha Stewart. Most of the flowers are from Prima. I've colored the image with my copics of course.